Thanks to our loyal Louisiana Musician advertisers! Thanks to our confirmed Conference vendors! 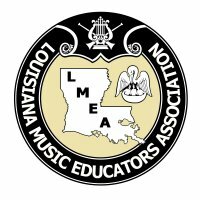 We encourage all LMEA members to utilize the LMEA website. LMEA will be moving towards more on-line registration for various events. Pertinent information will also be available and updated periodically. I trust that your transition from summer days to school days proved to be a smooth path. It is wonderful to return to students who share our love for music. From there, we can take on any challenge that the school system places in front of us. I anticipate great things in my second, and last year, as LMEA President. We will enter our third season of Regional, rather than a one-site state assessment. There is much to consider in working toward consistency as the sites rotate each year. In order to be a viable and sustainable event our district directors need to hear from you, our LMEA members. We consider all interests and make decisions that accommodate members equitably throughout the regions. State testing for core curriculum ‘takes no prisoners’ - (having a fierce, relentless, or merciless character – Webster). This is all the more reason to validate our music education instruction through positive and proven assessment by colleagues in the field. Thank you for continuing your support of LMEA performance assessment activities. All students deserve access to and equity in the delivery of music education, one of the subjects deemed necessary in federal law for a well-rounded education, which is at the heart of NAfME’s stated mission: to advance music education by promoting the understanding and making of music by all. This is also the focus of LMEA. Please join us by becoming involved with advocacy for music education in your district. Our job as music educators inherently brings us into a political realm. School systems are a political entity. We can influence the politics of education through the friendship bonds we establish in our connected community: school board members, administrators, parents, and students (who will one day vote on education issues). And, it never hurts to do the job well. Onward and upward as we meet our daily challenges in the classroom and the community. I look forward to seeing each of you at our fall conference November 16-20, Crowne Plaza Hotel, Baton Rouge where we will enjoy informative clinics and meetings, awesome music ensemble performances, and take time to visit with friends. More on the latter when I see you . . . Secure Website: Please use https://lmeamusic.org to access it as a secure site. It won’t automatically roll over to the secure address – you must put it in. The first time you login, you’ll need to click on “Sign Up.” Enter the email you used to renew your membership and a password of your choice. You’ll be sent a verification email and will need to click “Confirm Your Account.” That’s all. If you have any problems, email memberservices@nafme.org. They are not staffed 24/7 so you will only get an answer during their extended business hours, but they have been replying and fixing problems very quickly. If you cannot get a problem resolved, email me and I’ll try to help you work through it. NOTE: If your email address has changed, you’ll need to email memberservices@nafme.org to have them change it in their records before the login process can be completed. Manage Profile – when you log in to either LMEA or NAfME, you have the option to update the information in your profile. Just be sure to click “save.” It’s way down at the bottom of the page. My NEW email: sharon.mcnamarahorne@gmail.com. Please let me know if I can assist you in any way. Conductor for the 2017 LMEA All-State Jazz Ensemble will be Wycliff Gordan, world-renowned jazz trombonist, arranger, composer, band leader and music educator. He is currently the Artist in Residence at Georgia Regents University. All State Orchestra Audition Recording Submission Deadline postmarked by Friday, September 22, 2017. First round audition selection will be “Heilig” by Mendelssohn – 8 part –Walton Edition (W2163). Second-round audition piece will be “To Thee Cherubim and Seraphim” by Handel - SSATB–edited by Alex Favazza. Hinshaw Music – HMC2530. This piece is only in 5 parts (SSATB) but it is a great choice for our audition. Sopranos will divide sop 1 and sop 2 as always. Alto 1 and 2 will sing the alto part, Tenor 1 and 2 will sing the Tenor part and Bass 1 and 2 will sing the Bass part. The parts cover the ranges necessary for all the other pieces to be performed this year at all-state. We will still have 8 separate audition rooms as usual, there will be no combining. Conductors for the 2017 LMEA All-State Bands will be Gary Green, the University of Miami Frost School of Music, for the Symphonic Band and Alfred Watkins, Lassiter High School, for the Concert Band. Featured Clinicians for the 2017 LMEA Professional Development Conference will include Sandy Knudson, Artistic Director of the Norman (Oklahoma) Children's Chorus and Lamar Robertson (Sponsored by LAKE), internationally-acclaimed Kodaly music educator.